Funny, witty and laughable times I had with deaf people. A couple of days ago (January 20), the entire Filipino Deaf Community (as shown in their Facebook reactions) was shocked when a twenty five year old deaf committed suicide by jumping off JR Borja Bridge in Cagayan De Oro City at around 9:55pm of January 19. Ryan C. Lutching, a former student of La Salle University – School for the Deaf in Ozamiz City and an active member of a deaf group in Mindanao, left his smartphone on top of his red bag turned on showing his suicide note before killing himself. Brian Maglangit Mutas first posted the incident in his Facebook account. In his photos, bystanders and onlookers were looking at the bridge where it happened. I guess no one was there to save him during that time. Brian also took pictures of the messages that Ryan posted in his cellphone. Ryan’s body was found two days later (January 21) washed away at Macabalan river shore. Messages on his phone indicated that Ryan was apparently talking to his “Bro” or brother and that he is ending his life because he is undergoing depression. He said that he misses his father who already died and he felt alone because his relatives and other family members never talk to him. My deaf friends told me that only his father knows how to sign. Ryan also mentioned that he got jealous of his male friends who already have relationships and they even teased him for being single. Ryan mentioned “depress” three times (Only two appeared here because the other one was in the previous page.) Note: I blocked the names of other persons mentioned to protect their privacy. Strangely, Ryan posted this cryptic image on the same exact date he died one year ago. Some of my deaf friends informed me that it was his father who died on that day. Ryan posted this in 2018 on the exact same date he committed suicide. Earlier this month, Bryan Velasco, a Filipino rock band Razorback’s drummer fell to his death from a condominium. He was 41 years old, and it was an apparent suicide. Velasco jumped from the 34th floor and landed on a canopy. There were no other injuries. The drummer went live on Facebook and filmed his death Wednesday morning. a common and serious medical illness that negatively affects how you feel, the way you think and how you act. Fortunately, it is also treatable. Depression causes feelings of sadness and/or a loss of interest in activities once enjoyed. A few decades ago, depression is commonly associated from being sad and grieving from say a death of a loved one, losing a job or ending a relationship. But now, scientists have found out that it is a medical condition that distinguishes it from just “being sad”. What about depression and deafness? One reason why I made a post about this is to document the incident because until today, mainstream news media hasn’t picked it up. The other is to inform everyone that depression is a serious condition that affects everyone, including deaf people. Studies have found that deaf individuals have higher rates of psychiatric disorder than those who are hearing, while at the same time encountering difficulties in accessing mental health services. These factors might increase the risk of suicide. However, the burden of suicidal behavior in deaf people is currently unknown. Most of them do not have someone to talk to. As what happened to Ryan, his father passed away and he was the only one he can communicate with. Other members of his family do not know sign language. Lack of communication results to low self-esteem, delays in learning and isolation. It’s hard to share or talk about how a deaf feels or thinks because they have a very small community. The deaf community is a very tight group. Everybody knows everyone. Telling one of them about your problem is like announcing it to the entire “nation”. This sometimes lead to embarrassment, negative branding and even becoming an outcast from the community. Many hearing people don’t know or understand Deaf culture. Some of them still perceive that deaf people are dumb (i.e. reading a broken English sentence), does not care about others (i.e. not mingling with other hearing people) and moves their hands and face like a fool (i.e. doing sign language and facial expression). These misconceptions often lead to teasing, discrimination and abuse. I always love being with deaf people. I have no deaf relatives. But I have grown to love them for nearly 30 years. They are fun to be with and they basically “enjoy life”. But deaf people are primarily human beings who react from negative situations and emotions. They are more vulnerable to stress, mood swings and misery because of limited interaction with other people. Sadly, as far as I know, there is no existing “Depression Helpline” in the Philippines that focuses on deaf people. The reason for this probably as enumerated above, is lack of trained counselors/medical personnel who can sign fluently and understand deaf culture. Tell him to talk to a friend, family or someone he can trust. Encourage him to visit a doctor and talk about his problem. The doctor will be able to check his mental health and discuss his next step. Remember to book an interpreter. Be a friend. Learn sign language. Understand deaf culture. Doing this may save his/her precious life. Last year, Philippine President Duterte signed into law the Filipino Sign Language (FSL) Act. The Republic Act 11106 recognizes FSL as the true and living language used by the Filipino Deaf community. However, some people contested the name. The issue: why use FILIPINO Sign Language, not PHILIPPINE Sign Language? Glottolog, a comprehensive reference information for the world’s languages, especially the lesser known languages, listed the language used by the Filipino Deaf as Philippine Sign Language. Also, SIL International, (formerly Summer Institute of Linguistics) lists the language as Philippine Sign Language. They even made an identifier code of ISO 639-3. These recognitions further strengthen the legitimacy of PSL as the right name. In 2006, I became one of the editors of Wikipedia, the world’s largest free online encyclopedia. Using Jomanila as my editor name, I was able to create a few notable articles. One of which is “Filipino Sign Language” which I posted in February 15, 2008. However in 2012, a certain tyrant and “feeling god” editor/dictator named Kwamikagami vandalized the article name by changing it into PHILIPPINE SIGN LANGUAGE. I humbly asked why the sudden change and explained my side. But he still defended his action simply because he is a “demigod” and he does not care for others’ truth. Because I cannot challenge his abusive “powers”, I just let him be. You may view our heated exchanges here. Both Glottolog and SIL were used as bases for the Wikipedia article change from FSL to PSL. These supporting sites further strengthen the Wikipedia tyrant’s decision to change the name of the article. So the name got stuck for nearly five years. Minor edits and information were added but the name PSL stayed, until the law was passed. I added the information about the FSL Law in November 2018. Thankfully last December, a Filipino Wikipedia Editor named HaribonEagle927 moved the page to Filipino Sign Language after pointing it out in my talk. Still, many senior Filipino deaf insist that PSL is the right term because this is what they were accustomed to. Some even invented the name PINOY Sign Language as a better term and created their own Facebook group in 2014 to support this. The group currently has 240 members. That is why Aldrin Gabriel, a well-respected deaf video blogger and one of the founders/administrators of Filipino Deaf Vloggers: Feed, Awareness and Openness Facebook Group (FDVFAOG) decided to post his explanation about the issue. Aldrin, an alumnus of MCCID, happens to be one of my very best deaf students. He is a very creative artist, a local champion and Philippine representative in the International Skills Competition held in Japan in 2007 and the only Filipino Deaf actor who interpreted the “Mi Ultimo Adios” poem of National Hero Dr. Jose Rizal in Filipino Sign Language. FDVDAO Group is a closed invite-only Facebook group which now has nearly 4,000 members, majority of whom are deaf and hard-of-hearing. You can only post video blogs in sign language. Personal opinions and views of all the members is highly respected so bashing is not allowed. I was honored to be invited in this group. You may view his ten-minute video in Filipino Sign Language by clicking on the YouTube link below. Aldrin’s explanation is very simple and straightforward. He even used a paper diagram to illustrate his point clearly. I added the English caption/subtitle for the benefit of those who are unfamiliar with the language. I am sure you will now be convinced that FSL is the correct name after viewing his video. Cheers to Filipino Sign Language and the Filipino Deaf Community!!! Note: He corrected the word AMERICA in his paper illustration to AMERICAN. Sorry for the error. Did you know that Ma’am Coryell already recognized Filipino Sign Language? Disclaimer: I am not an official biographer of Rev. 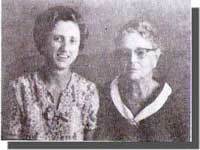 Aimee Ada Coryell. I don’t know if she has one. But I certainly am not for one simple reason, I have only been with her for a very few short days. However, here are the significant details that I personally learned from fellowshipping with her. 1. … Ma’am Coryell has already observed and recognized the existence of Filipino Sign Language? 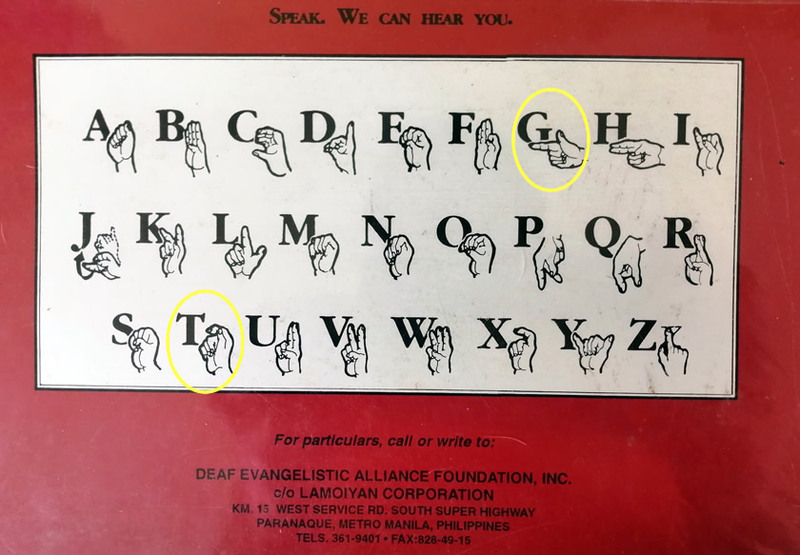 Long before the interest about a unique language used by the Filipino Deaf started to gather support in the mid-90s, Ma’am Coryell has already been using them since the early 1970s. As an American missionary and teacher, Ma’am Coryell is a product of the Peace Corp Volunteer Group that was stationed in different parts of the Philippines. She was a native American Sign Language (ASL) user and has taught this to the Filipino deaf. As a founder of DEAF School in Laguna in late 1960s, she has strictly implemented the use of ASL in classes due to limited sign vocabulary. However, she has noticed that her students have been using signs that are distinctive to them and which has been slightly diluted with the signs used by deaf community living in Manila. But because the Laguna school is somewhat isolated from the rest of the community, they have developed their own peculiar signs. That is why during the nineties, teachers for the deaf as well as sign language interpreters have categorized the educated deaf according to the community where they belong. Labels like “Laguna Sign”, “Philippine School for the Deaf (PSD) Sign or Manila Sign” and “Bohol Sign” have been widely branded. Ma’am Coryell has already identified the inherent weakness of the deaf in accessing the written language that is why she included mostly ASL signs in her book “The Basic Way To English for the Deaf”. However, if there are words that she has observed that have signs commonly used by the Filipino Deaf, she incorporated them in her book. At the back cover of her book, notice the use of “G” hand which is gun shaped and the “T” hand. Both are Filipino Sign Language fingerspell. There are other “FSL signs” that appeared in her book. Although she did not name them as such because Filipino Sign Language has only been coined in mid-90s, she often refers to them as Philippine Signs. 2. … Ma’am Coryell does not know how to speak Tagalog? I already mentioned this in my previous post so I will just copy-paste it here. Did you know that despite of staying here for many decades, she still cannot speak clear Tagalog? She can only utter perfect “PARA” to tell the jeepney driver to stop. I politely asked her why she never became fluent in Filipino. She confessed that she too has a problem with her ears. She is having difficulty hearing Tagalog pronunciations and diphthongs (sound formed by the combination of two vowels in a single syllable). But what she lacked in learning the local language, she compensated it with her love to the visual language of the Filipino Deaf. 3. … Ma’am Coryell is a speed typist? 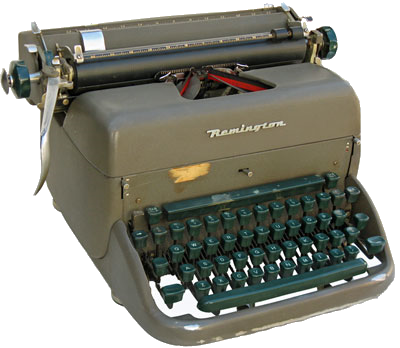 On a manual typewriter, the average person types between 38 and 40 words per minute (WPM), what translates into between 190 and 200 characters per minute (CPM). However, professional typists type a lot faster — on average between 50 and 60 WPM. The rate is quite different in a digital keyboard which is being used in laptops and Personal Computers. Ma’am Coryell “boasts” of typing an average of 85 words per minute! Believe me, I’ve seen her do it. She explained to me that as part of their training as a Peace Corp Volunteer, they are required to acquire and master skills that they can teach to their assigned country. One of them is using the typewriter to create reports, documents and even correspondents. She wants to accomplish things fast and perfect. I believe Ma’am Coryell is the only one who typed the contents of all four of her books. I added an image of a manual typewriter here for the benefit of new generation of technology users who have never experienced, much less seen what we have been so much accustomed of using. My Dad gifted us one similar to this when we were still in grade school. This is one of his special gifts that we cherished a lot aside from the Kolski piano. He gave us tools to harness our skills. That is why I can type at least 65 words per minute. Philippine President Rodrigo Duterte signed the into law in January 9 Republic Act 11166 or the “Philippine HIV and AIDS Policy Act of 2018”. Under the law, the government is mandated to establish programs and policies and adopt a multi-sectoral approach to prevent the spread of HIV, and ensure access to HIV and AIDS-related services “by eliminating the climate of stigma and discrimination” on patients. The Philippine National AIDS Council is reconstituted and streamlined to ensure effective implementation of the country’s response to the spread of HIV and AIDS among the population. It also provides penalties to people who will discriminate against HIV-positive individuals and enables minors 15 years of age to get tested for HIV. Health Secretary Francisco Duque has lauded the recent signing as well as informed the public about the alarming rate of increase in persons infected with the virus. Latest data from the Department of Health (DOH) showed that 945 newly-diagnosed HIV cases were recorded in November 2018. This is truly a cause for alarm because it also affects the Filipino Deaf. I even heard of one deaf who died of complications due to AIDS. Nearly a week ago, Outrage Magazine, the only publication dedicated to the Lesbian, Gay, Bisexual and Transgender (LGBT) groups in the Philippines uploaded a series of videos in their YouTube Channel explaining the nature as well as how to get an HIV-AIDS Test in Filipino Sign Language. This to me is very timely as well as helpful in raising the AIDS awareness among the Filipino Deaf Community. There are a significant number of deaf who belong to the LGBT community. They even organized a group called Pinoy Deaf Rainbow and has been participating in many related activities like Pinoy Pride and beauty pageants. I believe most of the actors that appeared in the Outrage YouTube videos are members of this group. They have and active Facebook Group Page aside from the YouTube Channel. Here are the YouTube Videos from OutRage Magazine. Please click on each video to watch it. I still remember how she proudly told me that she walks seven kilometers uphill to Deaf Evangelistic Alliance Foundation School (DEAF) in Cavinti, Laguna almost twice a month! These past years, advanced age has caught up with her. She can hardly even stand during her 93rd birthday. She was on and off the hospital while staying at a halfway house in Caloocan and attended by one of her deaf wards. During her wake at Sanctuarium in Quezon City, I was blessed to fellowship with the man who took loving care of her legacy, Sir Salvador Cuare, the principal of DEAF School in Laguna. He still remembered me when we visited the school so many years ago. I confessed to him that I was there to honor and pay dear respect to a very wonderful Christian woman who has faithfully devoted her entire life preaching the gospel to those who cannot hear. A strong “Amen” was his thankful reply. The Philippines, although Catholicism is the majority faith, has a significant number of other Christian denominations and groups. This also holds true with the circle of deaf groups. Many Catholic parishes as well as schools and laymen’s organizations embrace and support the deaf community. I have many friends who belong to these groups and I attended and fellowshipped with them at times although I don’t participate in their church activities. I am personally involved with non-Catholic Christian groups, specifically the Baptists and Evangelical churches. Ma’am Coryell belongs to this family. I made a few Facebook posts during her birthdays although I never attended in any of it. But I made it a point to be there in spirit and in prayers. I was one of the many many deaf and hearing people whom she has touched and have been influenced by her Godly words and actions. Manila Christian Computer Institute for the Deaf was one of the schools that Ma’am Coryell has graciously collaborated with. Among the many wonderful activities we shared was assisting her in the publishing and promoting of her four books, “The Basic Way to English for the Deaf” in 1996. We continue to use this as our guide book in our English and Sign Language classes. Thanks goes to Remberto “Jojo” I. Esposa Jr. and family of the Manila Christian Computer Institute for the Deaf Foundation, Inc. for the instructions and help they gave on putting the first book into the computer. Although I was not able to spend a longer time with her unlike many of her deaf students in Laguna, those times I had with her were very fruitful and very humbling. Did you know that despite of staying here for many decades, she still cannot speak clear Tagalog? She can only utter perfect “PARA” to tell the jeepney driver to stop. I politely asked her why she never became fluent in Filipino. She confessed that she too has a problem with her ears. She is having difficulty hearing Tagalog pronunciations and diphthongs (sound formed by the combination of two vowels in a single syllable). But what she lacked in learning the local language, she compensated it with her love to the visual language of the Filipino Deaf. I was blessed to personally experience how she has dedicated her life not just in educating the Filipino deaf, but also taking care of their physical well being. One time, I was with her in going to a government hospital in Quezon City to check up on a poor deaf girl who was confined there. She explained that there were no big hospitals in the province that are willing to accept her. That is why she took time to bring her all the way to the city. Ma’am Coryell also has no money during that time so she persuaded hospital officials by pledging herself as security for payment of bills so that they can attend to the deaf girl. In behalf of the Board of Trustees of Manila Christian Computer Institute for the Deaf, we humbly salute this wonderful woman of faith and courage serving Christ by giving education to the Filipino deaf. Thank you very much for offering your entire life evangelizing the Filipino deaf and making MCCID as one of your partners in bringing hope to them. We will continue to freely host the unofficial website of DEAF Inc. which was designed by our deaf students in 2006 as our own small way of saving her legacy for future generations who would like to search online about her wonderful works.